With that approach, a majority of those follow up calls do not go well. Then they come to us with their dejected sales frowns claiming the “lead is no good”! The lead may not ready to buy, but the LEAD IS GOOD! Let’s take a look at the proper follow up when a prospect takes an action on your website, identifying themselves as a lead. According to industry best practices, following up within 48 hours of the prospects action is most effective (and in some cases, you’ll want to follow up within minutes). Here’s where the big mistakes are made. Most salespeople want to follow up by making an initial call, identifying themselves and immediately looking to diagnose the prospect’s problem. After all, they did download something so they must have some pain, right? Even worse, the sales professional jumps right into the proverbial “We-Do’s”. This will turn off your prospect almost immediately! Instead, take the “Always Be Helping” approach. Don’t start off with a sales pitch, instead offer more content that is similar to the content they already expressed interest in. Stay away from the traditional, “Hey I saw you attended our webinar…or I noticed you downloaded our whitepaper, what else can I help you with?” It doesn’t work! When making the initial call, offer to schedule a brief 15-minute conversation with the prospect to provide more detail about the content they have shown interest in. It’s critical that you maintain a teaching/helping posture here, as the prospect may, in fact, not be thinking about buying anything at this time. Much like catching fish, if you start trying to real them in too fast, you’ll lose them forever. 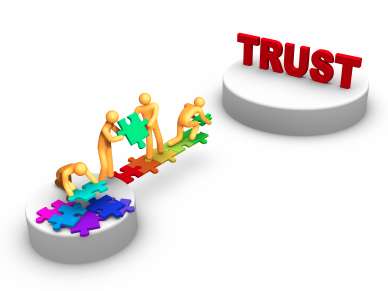 Your job is to begin gaining their trust and be recognized as a trusted resource, not a sales person. We have noticed that our clients tend to get 45-50% more meetings this way versus the traditional follow up techniques. It’s important to understand that it isn’t until the second or third content sharing touch point that they begin to trust you. They start lowering their protective barriers and open up to other conversations with you. This will rarely happen on the first call. After you’ve established your desire to help and not sell, they begin to collaborate with you, share information about their company and feel comfortable enough to ask you questions. This is also when you get to ask about the potential to move forward based on what you have learned about your prospect up to this point. Any attempt to move the prospect into a sales ready position prior to this point, will cause more harm than good. We regularly advise our clients that the key to shortening the sales cycle is to slow down the sales process. Now that I covered the “easier” of the two lead follow up calls, let’s talk about the experience that many of us typically have when reaching out to a prospect that has recently taken some sort of action on our website. What happens when they don’t respond to your initial outreach? I already mentioned that your initial follow up should be within 48 hours of the prospects action on your website. It’s important to follow these steps in the proper order and cadence to increase your probability of success. Initial follow up call within 48 hours leaving a voicemail offering additional free content that they might find of value. Follow up that call with an e-mail within 4 hours referencing the voicemail. Follow up that 2nd voicemail with an e-mail, again referencing the voicemail that you left. Call again and leave a voicemail immediately followed by an e-mail that states this will be your last attempt at making contact with the prospect. It’s amazing how many prospects call back when you leave the “This is my last attempt and I wish you the best” voicemail. Please keep in mind, every industry is different and you have to experiment as well as A/B test your follow up approach not only for your industry, but for your buyer personas. It would be nice if there was a “one size - fits all” follow up process for Inbound Leads, but this provides a great framework for you to start increasing your success with turning Inbound Leads into Sales Qualified Leads.